That's what I have for you today. 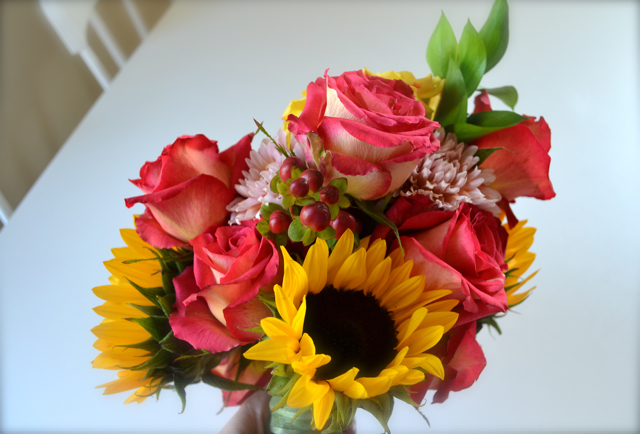 A glimpse at my DIY bridal bouquet composed of sunflowers, roses, dahlias and hypericum--fall's finest, eh? (More like "fall's only"--no joke, there was nothing else available besides droopy looking carnations and some unidentifiable green stuff). I purchased all of the flowers from our local Whole Foods the night before we headed to city hall and then arranged them at the kitchen table. I was pleased with how the finished product turned out, considering I've never made a real bouquet before. I wanted a natural looking, somewhat asymmetrical feel and think I achieved that. I didn't know I was supposed to use floral tape (oops), and instead, secured it with tight fabric ribbon (several layers tightly wrapped and then knotted & tucked). The bouquet more than withstood the torrential downpour, so I guess I did something right. 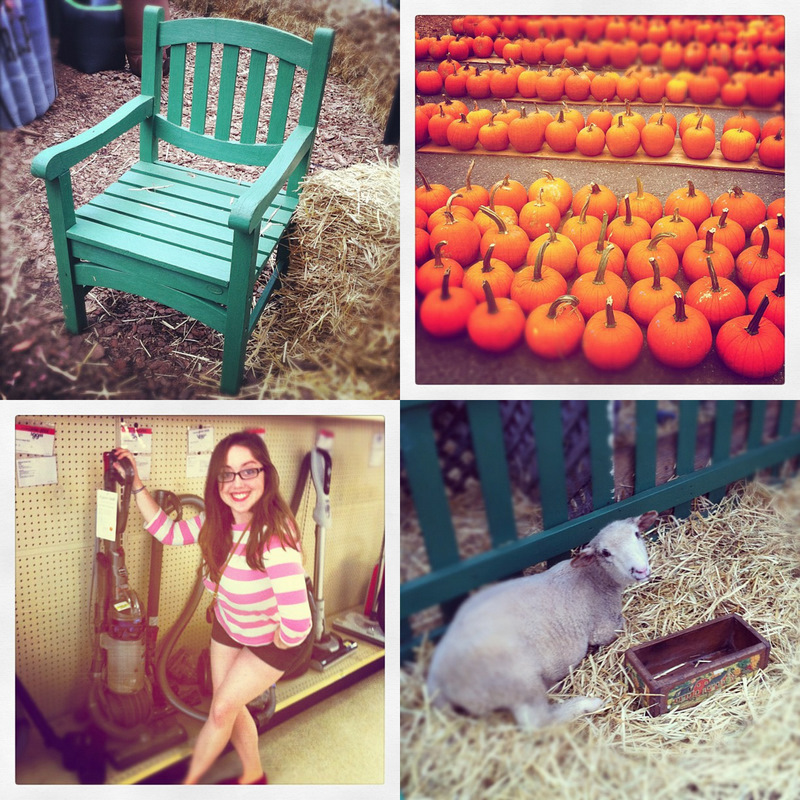 Snapped these instagram shots once we returned home and dried off. We changed into pajammies and shared an entire bottle of French champagne. My wedding band isn't an official match to my engagement ring, but I think they complement each other nicely. I wanted a whisper of a ring that could stand out on its own. This photo duo makes me smile. Pure happiness right there. And last, the adorable farm store and petting zoo we stumbled upon whilst driving home from our movie date. I spotted a sign that read "Cinderella pumpkins" and made Tiho pull over. I might have clapped my hands together and performed a little jig when we walked around back and encountered two goats, a sheep, a (gigantic) pig and several bunnies. I fed them pellets and then bought a caseload of gourds for my classroom. The photo with the vacuum transpired in Sears, which was the original reason we detoured and subsequently found the farm stand. Our floors are in desperate need of a cleaning because our current vacuum picks up approximately one out of every ten dust particles. Not that you really care about our vacuum, or the state of our floors. Focus on the lamb. Or the perfectly arranged pumpkins. I was impressed too. your bouquet is stunning! I wanted to make mine myself too, but alas I realized I have absolutely no floral talent. can't wait to see more pictures from wedding #1!!! GORGEOUS job on your bouquet, Kayla! Darling, I can't tell you how these posts lifted my spirits and made me smile. Could not be happier for you! aw, so adorable! all of it - the sheep yes, but also you post-marriaging, and the fact you whipped up a beautiful bouquet the night before. i can't wait to see more photos of your romantic wedding in the rain! 1) the bouquet is gorgeous! 2) the ring? holy smokes!! Your bouquet is beautiful! And your rings look great together even if they aren't an "official match"
Hahahaha! Girl, you crazy. Vacuum those floors. Git 'em! Fall is not the same, here. Sure wish it were. 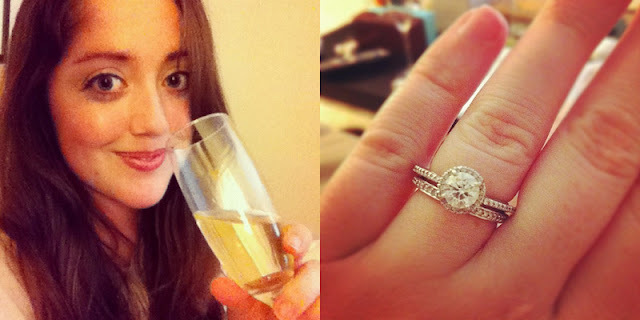 Your wedding band is exquisite - and it suits you! Congratulations on your wedding!! The flowers are stunning, the ring divine, but the little location you discovered...you just had magic thrown all over you this weekend, didn't you? Also, I just realized that your last name (or used-to-be last name?) is the same as the town I currently live in. Just a little fyi, ha! baaahahaha! the title of this post made me laugh out loud. and honestly i think vacuuming is the most rewarding chore *ever*. there is no better feeling. There are various online florists offering Christmas flower deliveries however there are not very many to depend on https://www.thechristmasflowersdelivery.com/ is the best online florist that certification the freshest Christmas botanical deliveries with best flowers utilized and sent through neighborhood florists around the goal to guarantee on time deliveries. Try not to get a handle on missing any one this Christmas, simply send flowers and express your adoration and deliberately. A few shops will do it for a cheap charge while most do it at a high cost. This more often than not relies upon the area of the individual where you need to send the blessing. On the off chance that it is inside the states, at that point you can discover numerous online thanksgiving flowers to send benefit that offer this, however in the event that it is outside USA you cannot discover numerous online stores that offer this sort of administration. Despite what the case might be, you could even now discover destinations that offer this administration. You should simply to continue perusing this article and you would take in the best possible approach to do this for cheap. There are such a large number of flowers sent like valentine flowers delivered today services and got on Valentine's Day that costs can turn out to be peaceful high. At times, those that hold up to the last moment to send flowers for Valentine's will find that they have little to look over. You can dodge this surge, absence of choices and the additional costs required by requesting your flowers early. Many spots have florists that will offer for early requests, rebate flower delivery. Pittsburgh is among these spots. Numerous botanical delivery administrations have delivery following accessible so you can take after your gifts completely through to their goal. With this you can guarantee that your life partner will get new flowers in a brief timeframe.